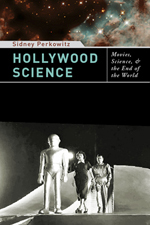 In this book, a scientist and dedicated film enthusiast discusses the portrayal of science in more than one hundred films, including science fiction, scientific biographies, and documentaries. Beginning with early films like Voyage to the Moon and Metropolis and concluding with more recent offerings like The Matrix, War of the Worlds, A Beautiful Mind, and An Inconvenient Truth, Sidney Perkowitz questions how much faith we can put into Hollywood’s depiction of scientists and their work; how accurately these films capture scientific fact and theory; whether cataclysms like our collision with a comet can actually happen; and to what extent these films influence public opinion about science and the future. Movies, especially science-fiction films, temporarily remove viewers from the world as they know it and show them the world as it might be, providing special perspective on human nature and society. Yet “Hollywood science” can be erroneous, distorting fact for dramatic effect and stereotyping scientists as remote and nerdy, evil, or noble, doing little to improve the relationship between science and society. Bringing together history, scientific theory, and humorous observation, Hollywood Science features dozens of film stills and a list of the all-time best and worst science-fiction movies. Just as this genre appeals to all types of viewers, this book will resonate with anyone who has been inspired by science-fiction films and would like to learn how fantasy compares to fact. Order your copy of Hollywood Science from Amazon.com today.